Go ahead and disagree. I say that without a hint of reservation or sarcasm. It doesn’t make sense to place the hopes of a well drafted team in the hands of someone who isn’t going to consistently give you the production you need from, what should be, the steadiest spot on your roster. So it pains me every year to see articles titled “Wait For A Quarterback” or “Quarterback Is Overrated In Fantasy Football” because those proclamations just aren’t true. 2013- 436 pts. 219 pts. 2012- 432 pts. 220 pts. Between 2011-2013 Drew Brees amassed 1,348 points to Calvin Johnson’s 702. Brees was 152% better than Johnson during that timeframe. Well my point is for those of you picking in the first round and looking to get the most bang for your buck ask yourself “what can I do with a player and a half worth of production from one guy? How flexible am I draft day when I can get that kind of player when everyone else is coveting other spots early? I’m not saying this to diminish the other positions at all. In fact I would love to have Calvin Johnson or Adrian Peterson on my team any day, all day (pun intended). But facts are facts, people, and we need to stop ignoring them. Golden Boys: Your 400-plus point, put your team on their back tier. These guys will put you ahead in a hurry and have the other team playing catch up before Al Michaels sits in his make-up chair for Sunday Night Football. Steady As They Come: 350-plus point potential every season with a shot at flirting with the Golden Boys. Good for 18-23 points per week with the occasional 40-point explosion. Duel Threats: Love the arms, love their legs even more. What they lack in pure quarterback skill they make up in giving you long runs and one to two touchdowns on the ground. Through the air they live in a respectable 275-plus point neighborhood. Add their mobility and that brings them to 320-plus territory in a hurry. Jekyl and Hyde’s: You know a 350 to 400 point is in there somewhere, but you can’t get the production that merits it on a week-to-week basis. They’ll give you 300-plus points easy but won’t make it easy and will somehow leave you longing for what you know they can do from someone else who does it. Toss Up’s and Borderlines: You’ve seen what they can do, but because of injury (Sam Bradford), inexperience (Nick Foles), or track record (Josh McCown) you don’t really know what you’re going to get. Screwed/Undraftable: These guys you wouldn’t think of drafting even if the price is free. They have very little value even on a good matchup week and if for some reason you’re stuck with them you better have top-10 talent everywhere else to have a prayer of a chance. Aaron Rodgers- (2013: 2,536 yards, 17 touchdowns, 6 interceptions) Before getting hurt Rodgers was on his way to another banner season statistically in Green Bay and for fantasy owners. He’s healthy in 2014 and firing on all cylinders. Draft him as soon as you can get him. Matt Ryan- (2013: 4,515 yards, 26 TD’s, 17 INT’s) The Falcons made a commitment this offseason to rebuilding their offensive line and making sure their franchise quarterback remained upright. With Julio Jones and Roddy White both healthy entering 2014 expect Ryan’s numbers to resemble something closer to 2012 and possibly eclipse career highs. Russell Wilson- (2013: 3,357 yards, 26 TD’s, 9 INT’s; 539 rushing yards, 1 RuTD) Seattle is putting more and more in his hands and that is a good thing for fantasy owners. Percy Harvin’s injury history is a concern but if he can stay healthy, and Doug Baldwin capitalizes on what should be a great opportunity taking over for Golden Tate, Wilson could be primed to move up a tier in 2015. 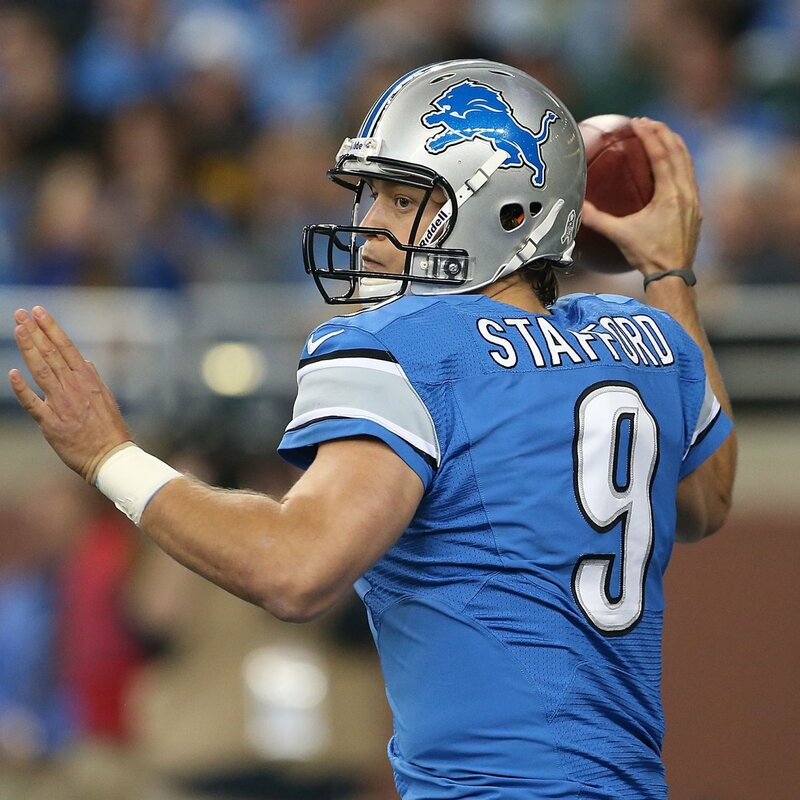 Matthew Stafford- (2013: 4,650 yards, 29 TD’s, 19 INT’s) How many weapons can one quarterback have? In the case of Stafford the answer is “not enough.” He enters 2014 with the look of a top-5 quarterback but the history of a player who hasn’t figured it all out yet. Still worthy of the keys to your fantasy team, but here’s hoping Joe Lombardi can straighten out some of those mechanical issues that lead to high interception numbers. Nick Foles- (2013: 2,891 yards, 27 TD’s, 2 INT’s; 225 rushing yards, 3 RuTD’s) I can hear the gripes out of Philadelphia, now. What do you want me to do? Put Foles in the same class as Andrew Luck before I really know what I’m getting? Foles was spectacular leading Chip Kelly’s offense year one but, as we’ve already seen this preseason, we have to see what he does year two. Drafting him too early in hopes that he’ll replicate his 2013 performance is foolish, but I could certainly see him creating a tier that falls somewhere between Jekyll and Hyde and Duel Threats. Geno Smith- (2013: 3,046 yards, 12 TD’s, 21 INT’s; 366 RuYards, 6 RuTD’s) Smith is the Wild Card of this bunch because so many are expecting him to take a step forward. What I don’t understand is where that step is supposed to land after he tripped, fell, swam, drowned, and washed up on a shore of mediocrity so bad it took stellar performances against some of the worst competition to categorize him as anything but a bust. Maybe he figures it out, but don’t use a roster spot on your fantasy team waiting to see if he does.